Jacob Zuma: Can he last past 2014? 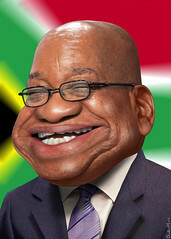 The ANC has backed Jacob Zuma for a second term as president of South Africa. This news comes a few days after the release of Adriaan Basson’s book Zuma Exposed, which details the interesting circle of comrades surrounding the president. It also comes a week after Mail & Guardian ran an expose on Zuma’s questionable financial entanglements. South Africa begins to feel like Israel, or France, or dare we say Zimbabwe, where those in high positions cling to office to escape their inevitable day in court. Zuma foiled attempts to get him to answer corruption charges related to the R60 billion arms scandal, which now appears as nothing more than a luscious pension fund for the ANC. As Basson points out, Zuma was by no means the biggest beneficiary from the scandal, but he remains dangerously tainted by it. Around him he has selected ministers and officials, many of whom are equally tainted. We have a new deputy president in the form of Cyril “zero to billionaire in 10 years” Ramaphosa who sits on more than 200 boards, covering just about every sector of the economy. How can he possibly raise his voice in any matter of national importance without there being a conflict of interest? Zuma attempted to redeem himself against the raft of allegations surfacing against him when he dwelt on the subject of tender corruption this week, estimated to cost the country R6 billion a year. But no-one takes this seriously until he answers questions about his own role in the arms scandal and related issues, such as the R200 million upgrade to his home at Nklandla. “Who in their right minds could have approved the expenditure of more than R200 million? And to do it in that area, where you have this nice place standing up and just around there the squalor and poverty,” Archbishop Desmond Tutu told The Star this week. It’s been quite a week for South African politics. The much-loved Trevor Manuel has bowed out of politics, hinting in no uncertain terms at his disquiet over the direction taken by the ruling party. Also out is former deputy president Kgalema Motlanthe, who stood against Zuma at the ANC conference this week. He receives a presidential salary for life, so won’t be in any hurry to ply his craft in the private sector. I suspect he will bide his time and attempt a comeback perhaps in 2014 in time for the next election. By then, the disaffection with Zuma will have reached boiling point with the rank and file. Despite the show of unity at the ANC conference this week, there remains grave misgivings over Zuma’s ability to rule and stand his ground in the international arena. SA remains very much the junior partner in the BRICS alliance. The Democratic Alliance (DA) will feast on this mess. It already has the Western Cape in the pocket, and next up could be Gauteng, the country’s richest and most populous province. The DA, generally perceived as a relic of white rule, has been making serious inroads into traditional black areas under Helen Zille, and recently took the mayorship of Potchefstroom away from the ANC. The DA is campaigning vigorously from Daveyton to Soweto, Eastern Cape to Limpopo. The ANC does all the grunt work for the DA, which need only point to corruption among senior ANC officials and the ruling party’s lack of service delivery. It’s clear the DA wants to take Gauteng and Northern Cape provinces in 2014. Once it starts to garner 30% and more of the vote, which seems likely (last election it took 25%), it then becomes a serious threat to the ANC. Then we shall see the ruling party’s commitment to democratic ideals. For these and other reasons I doubt Zuma will last much past 2014. The DA could well take Gauteng at the next election. The ANC, now under serious pressure to reassert its commitment to investment given the flight of capital following the Marikana massacre in August, will remain frozen in the headlights, held hostage by its left-wing. Economic growth will limp along at 2-3% a year, mining companies will start look elsewhere for opportunities and employment figures will tank. There will be more meddling in the economy by government, and ever more grandiose schemes to transform and rebuild the country. They will fail, each and every one of them, on the simple premise that government is already far too involved. It remains dangerously wedded to the misguided belief that only government can right the “imbalances” of the economy. The next few years will be nothing if not entertaining.